Every love story has a unique start - Jennifer and Cale Gale are an example of that. Living in the same town, attending the same high school, Jennifer knew of Cale but they were in different cliques. She was the cheerleader; he was the "grease monkey" reminiscent of the movie "Grease" if you ask me. Meshing their two worlds seemed impossible. Attending races as a young girl, Jennifer’s family had a friend who raced and was a big competitor of Cale’s father Bubba. Never meeting then, it took until high school for the pair to meet, and in a rather funny way. Love at First … Dare? Jennifer attended a race with her sister, who was dating one of Cale’s father’s rivals. The “spark” to Jennifer and Cale's love match began on a dare. After being reluctant at first, Jennifer caved to the peer pressure and jumped in Cale’s line. Much to her surprise, when it was her time to get an autograph, Cale knew who she was! The next weekend rolled around and Jennifer was back at the track and back in line to meet Cale. After Gale asked for Jennifer’s number, he called her early the next morning the rest is history. From what started as a friendship, Jennifer and Cale have now been “together” since 2001 and just married on New Year’s Eve 2011. 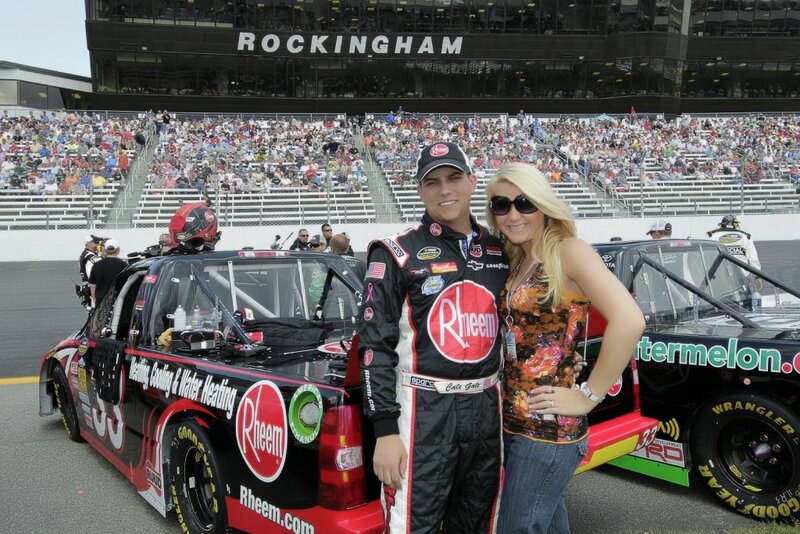 Cale and Jennifer at Rockingham. 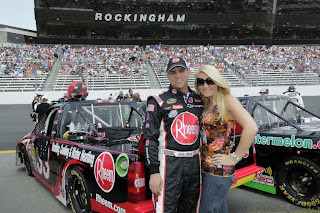 Living the NASCAR dream, Jennifer talked about the challenges of being a newlywed and a NASCAR wife at the same time. Seeing the Gales on SPEED’s "Newlywed Game," Jennifer and Cale are just one of the many new couples in the NCWTS series, joining the Craftons and the Bueschers. Asked if it helps having other young couples in the garage as “mentors,” Gale said they are all on the same journey and it is nice to have friends to turn to. 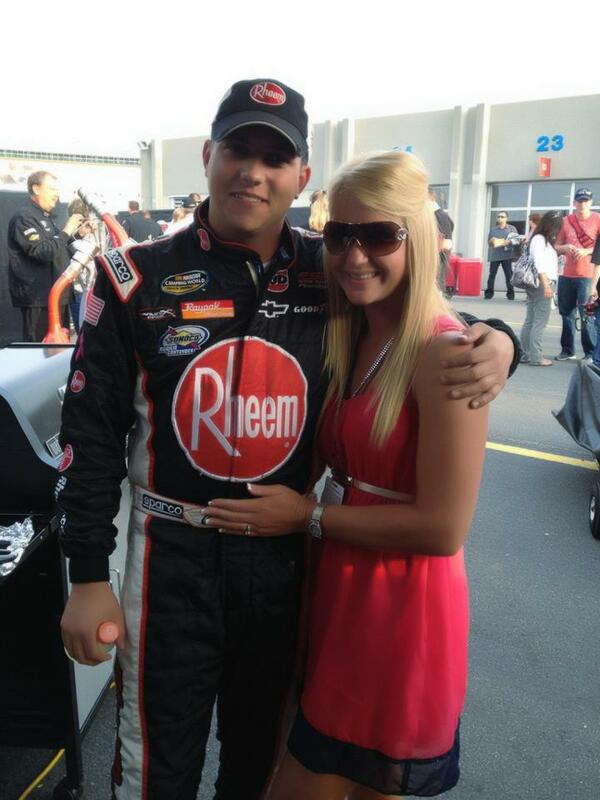 Jennifer and Cale at Charlotte Motor Speedway. Pre-race rituals are another topic that the wives dish on – from prayer to a certain meal, NASCAR’s finest can be quite particular. Cale, on the other hand, is pretty chill. He eats right leading up to the race and his only “ritual” is perhaps the best one I have heard yet. “One thing we always do, we have this really long talk the night before wherever we are at. We talk about the truck, how he feels about it, things that are on his mind and just basically clears his mind. We talk it out ‘how are you feeling, are you comfortable with the truck?’ It helps him a lot because this sport is so competitive and it gets crazy at times, it is important for Cale to stay sane though the process,” Jennifer said. “I am not a crew chief or anything but I understand the sport, I have grown up around it and we have done this together and I want to go through things together. It is important for me to understand and know what is going on, I feel like, if the truck is loose or tight I want to know and understand. The same goes for after the race, we talk and if it was a really bad race we will cry and hug it out and he feels better, that is really important to me. I am just glad that I am here to be with him,” Gale said with emotion. The love and connection between Jennifer and Cale was obvious in our conversation, from young love that started with those butterflies to now an 11-year-long relationship. The Gales are living the NASCAR dream and making young love work. This is the sweetest story I have ever Read!! Generally, this platform is designed for children and young adults. robloxlogin.us/ Include clothing gear after that establish atmosphere.